With the unique DAHLE CleanTEC® filter system for a better indoor climate and the convenience of the DAHLE Safe Technology safety package. Powerful motor for high shredding capacity, particularly quiet. Solid-steel cutters in special high-grade steel can cope with paper clips and staples. User-friendly electronics with electronic start/stop function controlled by integrated light barrier. Ergonomically designed control panel with illuminated function and information unit. Simple and safe paper infeed. Motor cuts out automatically when waste bag is full and door is open. Auto-reverse function. Energy saving from two inactivity levels: Sleep mode after 10 minutes and complete shut-down after 30 minutes. Widely opening door for convenient waste bag disposal. Good mobility from large casters and brakes for firm standing. High-quality wooden base cabinet. Including 10 waste bags and 400 ml of oil. filter system for reducing fine dust. The filter is made of special 3-ply, fully recyclable non-woven material. The filter can be changed quickly and easily. Permanent measurement of paper volume for uninterrupted shredding. Automatic acoustic switch-off function stops the motor instantly. Solid-steel cutters in special steel can cope with paper clips and staples. Multi-function control panel for fast, easy operation. Castors with brake for convenient mobility and firm standing. 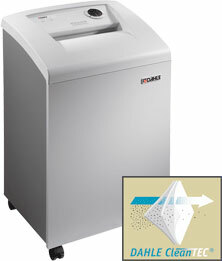 This document shredder destroys cheque cards. Integrated oil tank for controlled, automatic cutter lubrication. Separate waste box for CDs DVDs and cheque cards.